Mark, his wife and two children live in Canberra. However, Mark often visits his hometown Brisbane to satisfy his nostalgia, to visit old friends and to talk to his clients. While in Brisbane, he often stays at some of the city’s finest motels. Brisbane is a welcoming place. It offers the perfect mix of metropolitan and regional influences that, when combined, create a fruitful, opportunistic city with a laid-back country attitude. Residents of Brisbane are less up-tight than sister city counter parts, like Sydney. They are also easily led into sunshine-drenched beer gardens, market wonderlands and bicycle adventures. With so many activities at the fingertips, not to mention weather that is good enough to rival many European summer hotspots (even in the depths of winter); it is easy to see why this part of Queensland holds such appeal. However first time visitors are often unaware of the fabulous transportation system that is at their disposal. With that in mind, here is an insider’s peek into how best to traverse the city by bike, bus and ferry, and the sights you will see along the way. Take a bus from Adelaide Street in the city to the Teneriffe ferry stop. From there take a stroll down Vernon Terrace and admire the iconic Wool Shed Apartments. This part of the city has a great selection of bars, restaurants and cafes which serve up delicious food and experimental cocktails. Here you will also find a Brisbane CityCycle stand that offers residents and visitors the ability to explore the city by bike. You can obtain a casual subscription from their website for $2, which will allow you to use your bike for free for the first 30 minutes of every journey. The bike should also include a helmet you can use. From here ride your bike south-east down the river. There is an exclusive bike path so you can ride parallel to the river and enjoy the sunshine and scenic views the entire way. Snake around the back of the Powerhouse arts centre and find the CityCycle stand at the end of the track in front of the New Farm Park ferry stop. *Tip: it is illegal to ride a bike in Australia without a helmet. A beautiful riverside park complete with grassy areas, BBQ’s and children’s play equipment. You can stroll around the park area and get an ice-cream from visiting Mr. Whippy (ice cream) vans or chill out under the shade of a tree and watch the river life go by. From the New Farm Park ferry stop take the UQSL, NHAM or the NORM routes south down the river. The CityCat is a large catamaran ferry that stops at many locations along the Brisbane River. You can ‘cop a possy’ at the back or front of the boat and enjoy the glorious river views as the cat speeds along the water. 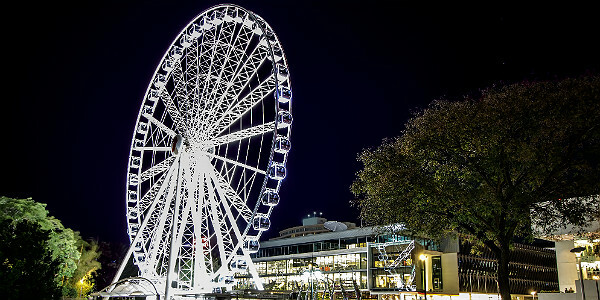 Alight at the South Bank ferry stop, turn left to find a selection of boutique bars and restaurants that serve a selection of culinary fares. Turn back on yourself and walk back towards the gardens and well-laid pathways. You will walk parallel to Brisbane City and the river on your right and the South Bank Parklands on your left. Veer into the parklands at any point to pull back the layers of this fruitful place. It is dotted with delightful eateries, bars and shops to tantalize and delight. There is also a man-made beach and sprawling swimming areas which are all patrolled by trained lifesavers 365 days of the year. Behind the swimming area, away from the river there are weekend cultural and lifestyle markets. Here you can find a selection of art work, jewelry, clothing and gifts from local designers as well as imported items. With over 100 stalls there is enough to keep even the fussiest shopper busy for hours. Further on from here you will find an amphitheatre which regularly plays host to touring acts and local entertainment – many of which are free. There is also a very large Ferris Wheel that was erected for the 20th anniversary of the World Expo ’88. You can purchase tickets on-site and view the city from a startling height. Just meters away, you will also see the QPAC and Lyric Theatres which feature cultural, operatic, theatre and musical productions all year round. From here you can access the Cultural Centre busway. Using your gocard take a bus to James Street in Fortitude Valley. James Street is an eclectic hub of high-end shopping, boutique bars and designer homeware shops. Quite a new edition to the strip is a bar called ‘Sixes and Sevens’. It is the perfect spot to wind down after an adventurous day as it boasts a multi-level beer garden complete with comical faux green grass. Choose from a selection of local and imported beers, Australian wines and delicious cocktails. They even do a range of bar-inspired nibbles. Just before the sun goes down jump back on a bus and head back toward the city down Ann Street to Eagle Street Pier. On the banks of the Brisbane River, Eagle Street Pier is home to some of the best restaurants in the city. Most of them have spectacular views of the river and of the Story Bridge to watch the last of the beautiful Brisbane sun. You can choose from the elite and eponymous Aria restaurant co-owned and operated by Matt Moran and Peter Sullivan. A good alternative is Jellyfish restaurant, a seafood specialist whose head-chef competed in the last Masterchef Australia series. But, if you prefer something a little less fancy, there is also Groove Train; a diner meets Al-fresco cafe with an extensive menu of pasta, pizza, salad and Asian-inspired dishes. Alternatively you can grab a take-away from the ever popular Grill’d Burger and feast away on one of the many benches along the pier. Brisbane is bright and glorious during the day thanks to the amazing sunshine and perfect climate. However it also lights up at night, thanks to its Ferris Wheel, Story Bridge, Treasury Casino, regular fireworks displays and the Skyneedle. Brisbane’s transport system offers travelers a selection of ways to get around the city including buses, trains and ferries. Thankfully all are easily accessed by the city’s travel system called ‘gocard’. It is easy to purchase a card from city news agencies or train station booths. The cards cost $10 (redeemable for travel credit when travelling) and can be topped up with credit using ticket machines found at news agencies and train stations. Come and visit Brisbane and eat, drink and be merry. Find Mark Tomich on Twitter – @TomMark84. How To Get There: Brisbane Airport (BNE) is approximately 10 miles to the city centre and is serviced by 31 domestic and international airlines, including Cathay Pacific Airways, Hawaiian Airlines and Virgin Australia. Information regarding area transportation is available here. Best Time To Visit: Brisbane’s climate is sub-tropical, which means it never gets really cold, even in winter. 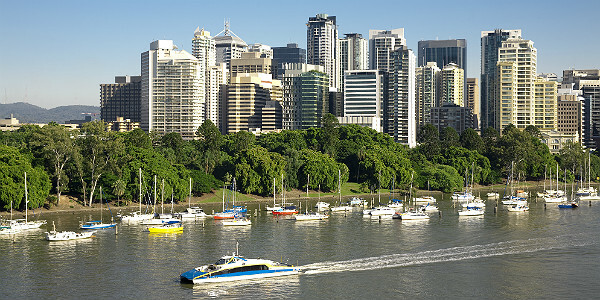 The best time to visit Brisbane is between May and October, which is their late fall, winter and early spring. During this period, the temperature is pleasant (it averages in the low 60s from June to August, which is their winter months), and there are a lot of events and activities available around the city, such as the Queensland Music Festival in July and the Brisbane Festival in September. Australia has built a comprehensive transportation system of airports, trains, highways, subways, ports, and waterways that in many places is world class.